A three-day strike by pilots at Lufthansa over early retirement, which has grounded Germany’s largest airline, shows no sign of ending early after management said there would be no further talks during the strike period. Lufthansa has cancelled 3,800 flights during the strike, which runs until the end of Friday, and says the stoppage will cost it tens of millions. The pilots’ walkout is the largest ever to hit the airline and the third strike at Frankfurt airport, Europe’s third-largest by passengers, in six weeks after industrial action by security staff and public sector workers. Both Lufthansa and the pilots say they are ready to talk. 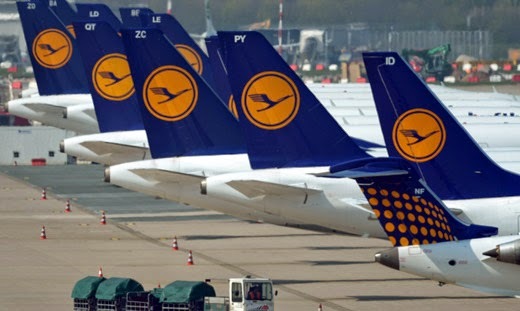 However, the pilots’ union wants to see a new offer from management first and Lufthansa said on Wednesday that no new negotiations would take place while the strike continued. “We’ll first see out the strike and then we’ll think about talks,” Werner Knorr, Lufthansa Chief Pilot, told journalists. Even if the strike is ended it is unlikely Lufthansa’s flight schedules will return to normal before Saturday. “It’s a system with 1,800 flights a day, we can’t just stop and start it. We’re concentrating now on returning services to normal for Saturday,” a spokeswoman said. The pilots want Lufthansa to reinstate a scheme that enabled them to receive 60 percent of their pay when they left their jobs before the legal retirement age. Pilots at the airline used to be forced to retire at 60, leaving them with a five-year gap before legal retirement provisions kicked in at 65. However, the retirement age for pilots was raised to 65 in Europe in 2011, and so Lufthansa says the scheme is no longer needed.